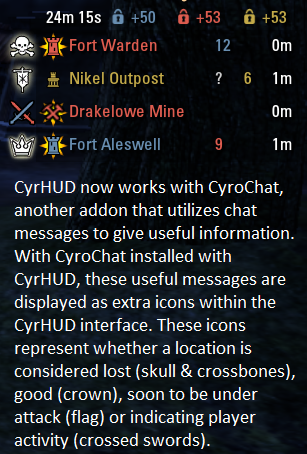 CyroChat is an addon born out of constantly being distracted by the many interesting, gross, entertaining, weird, sad, annoying and sometimes down-right insane chat messages that are seen in PVP. I wanted to create something that would take the useful information that often zoomed right out of sight and display it in various forms to the user, whether it be via a feed, notifications or even images. Skull & Crossbones: The location is considered 'lost'. Players often mean that other players shouldn't bother traveling from other locations to try to save it and instead to focus their attention on other locations. Crown: The location is considered 'clear'. Often players who say this are at the location and mean that, despite CyrHUD saying that it's still under attack, that the players attacking have been dealt with. (Battlegrounds) Flag: The location, despite only showing on CyrHUD as having some siege, will soon be under attack. Crossed-Swords: This displays player activity at that location. If the swords are not colored (white), then it's simply displaying any players that could potentially be there, but you know it's displaying because someone mentioned it (because, of course, if it's in CyrHUD, someone must be there). If the swords are colored, then the left sword is the alliance attacking while the right sword is the alliance defending. If all three alliances are mentioned at a location, the 3-flag will be shown. The integration with CyrHUD does not 'add' locations to the CyrHUD interface; I wanted to maintain that if the location is listed, it's either because it's under attack or there is siege there and not because a player said so. This way you know 'for a fact' that something is happened, as opposed to relying on humans. The extra icons are just extra information taken from chat that COULD be wrong, or being misrepresented. Also, the CyrHUD interface 'reloads' the locations when you fast travel (like via transit), so if icons are shown before you fast travel, they will be gone when you arrive at your new location. 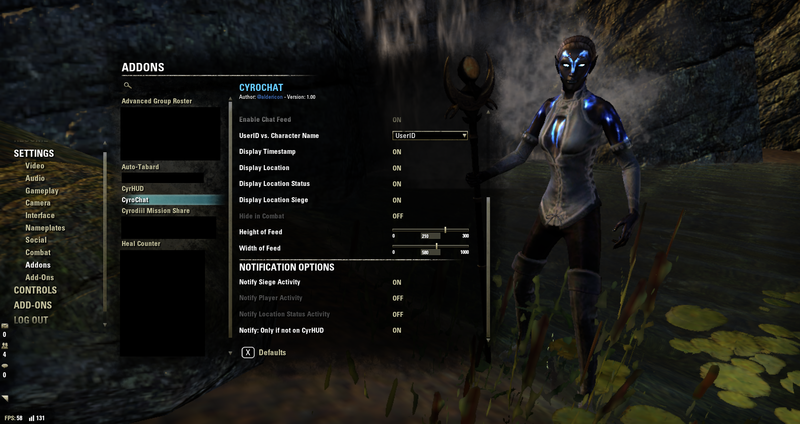 Note that this addon uses player-given information. I found that while most players aren't 'lying' about what they're talking about, this doesn't prevent them from giving wrong information. And CyroChat can only be so good at interpreting what humans are talking about; sometimes relevant messages might be skipped over for good reasons. 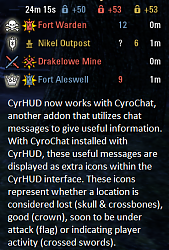 If you'd like to help CyroChat become better about interpreting what players say, feel free to submit chat messages that have been missed or cataloged wrong, either by posting in the addon's messages or by mailing '@aldericon' in game. 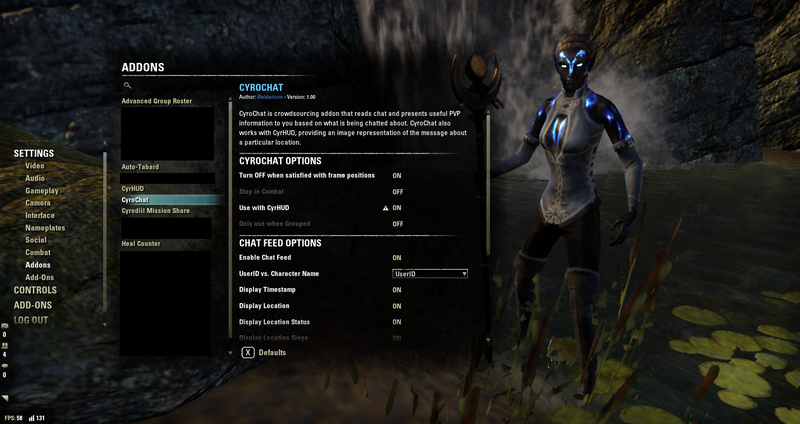 My hope is to continue to update CyroChat's algorithm to make the addon better with each update. Note that the addon was made while PVPing on Vivic NA server on the AD alliance. I have no intentions in creating a similar addon for non-english speaking zones, and the addon may miss stuff that is more relevant to other alliances.